I was a little skeptical of our decision to hike today, but it felt like our only option — we were on our way to the Finger Lakes region for a long weekend, and wanted to hike to a fire tower on the way, even if the peak was a bit of a detour. The alternative was to wait until Monday and hike it on our way home, but a heavy snow was predicted Sunday into Monday which would make not only hiking but driving more dangerous. So we set out early Friday morning towards the Western Catskills. It was only 10º that morning, and we had driven down long county highways that were only partially cleared. So when we arrived in the late morning, I was very thankful that we weren’t the first (or only) hikers to show up on this frigid day, right after a snowstorm. 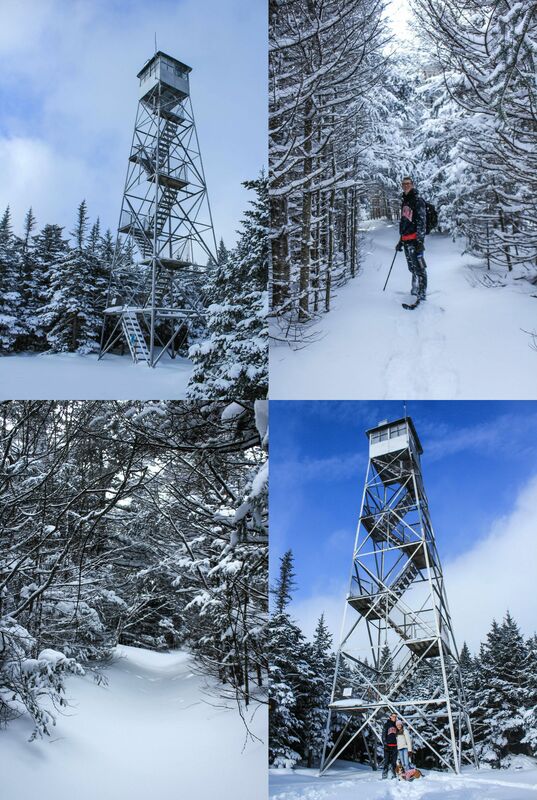 At the trail head, we layered up, strapped on our snowshoes and set off on the trail to Balsam Lake fire tower. Charlotte started by running up the trail as she always does, occasionally looking back and waiting until we were close before darting off again. The trail started with a steeper climb, but within a half mile became more level and was a very pleasant walk. We followed the snow shoe prints from the other hikers and were astounded by the high drifts that they had to walk through. It was almost waist high on me! After almost 2 miles, we caught up with a couple ahead of us, and just a few minutes later were right behind the first guy who had been breaking in the trail this whole way. Curtis called up to him and offered to take the lead, but he replied that he was actually taking a different trail and not going to the fire tower as the rest of us were. His turn came shortly after that and we all wished him luck and thanked him for clearing the trail as far as he did. The couple in front of us took the lead, but after only a quarter mile stopped and Curtis took over. Thankfully there was only ¾ of a mile left, but as I mentioned this was probably the hardest part. Not only were there large drifts, but it was colder and the trail had begun to climb steeply again. Obviously this slowed us down, but Curtis pushed on and we made it to the top about 2 ½ hours after we started. It was about 3 miles to the peak, so clearly this wasn’t our best time, but sometimes the fact that we made it is impressive enough! It was so beautiful up there as we walked through feet of untouched snow; snow lining every branch of every tree. We entered the perfect winter wonderland surrounded by balsam firs and the prettiest blue sky. The peak is just a small clearing with a cabin and the tower, with no view unless you climb the tower, but this trail was honestly one of our favorites — good, steady incline gaining almost 1200 feet and just 6 miles round trip. The other couple made it to the top a few minutes after us, and we exchanged pictures. Of course, since we were just standing around and not moving, our fingers started going numb so we decided it was time to hurry down the mountain. It took considerably less time to reach the bottom as we practically ran down the steeper sections. We made it back to our car around 4, making our total hiking time 4 hours. Not too bad! We ate a very late lunch (we don’t like eating at the peak when it’s so cold) and warmed up in our car. There was a different trail we could have taken which would have gone by a lake and made a small loop before meeting back up with the trail, but we opted to leave the same way we came — for the obvious reason that we had already cleared it, but also because the other trail had a steeper decline. Once we had finished the hike, I checked Google maps and realized our hotel for the weekend was still 3 hours away. We had been guessing it’d be more like 2, so that was a little disheartening. Not only that, but the last hour of the drive we ran into a snow/sleet storm on I-86. But on the bright side, we really enjoyed the scenic drive on NY Highway 30 in the Upper Delaware Valley as the sun set. We’ve now driven almost the entire length of 30 from the Canadian border, through the Adirondacks, the Schoharie Valley, and now the Western Catskills and Upper Delaware. It’s definitely our favorite highway in New York and worth skipping the faster route! We finally made it to our hotel and settled in for a relaxing weekend in the Finger Lakes.